What do you call a tangled mass of bull kelp on the beach? I’m not sure what you call a great spaghetti-like tangle of floats, stipes, and holdfasts, but after a long summer, masses and clumps of kelp wash onto the beach with the first big surf of the fall season. This clump was 112 feet long. It’s almost inconceivable, to me, that all that growth is annual; but it’s true. In my shore-bound world, summer tomatoes grow fast, and that just goes to show frame of reference is everything. I built a model to help me think about bull kelp growth. To reach 112 feet, an imaginary bull kelp stipe (the stem) would need to sustain a growth rate of 5.6 inches a day over an eight-month growing season, say March through October. My model is a simplified version of the real world, and the few assumptions I made are probably overestimates. However, the first and only reference I looked at to check my work, J. Duane Sept’s Beachcomber’s Guide, gives 5.5 inches per day. Vindicated! Sort of; I’m guessing most bull kelp is much less than 112 feet long, maybe in the 50-70 foot range. When I think of kelp in the wrack, I think about connections between the subtidal and the surf zone. A lot of subtidal creatures make a living on bull kelp, and I know someday I’m going to discover some amazing creatures I don’t normally get to see in the surf zone. I’ve already discovered several interesting non-surf zone animals on wrackline debris. One of the most interesting was Planes, an oceanic crab I found on a homemade float. I look forward to systematically dissecting a clump of kelp, part of a clump at least, to see what kelp associates I can find. Look at all those holdfasts; many-branched, cup-shaped grips for grapefruit- to basketball-sized rock anchors. Small anchor-rocks like this one, holdfasts still attached, were strewn about the beach on November 7, 2014 when I found all the mounds of kelp shown in this post. 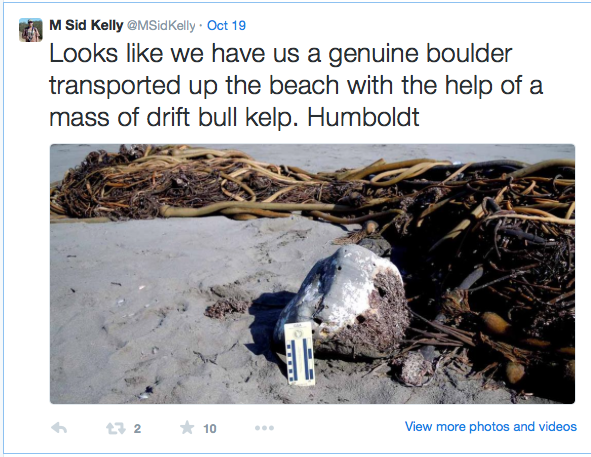 The biggest kelp-transported rock I’ve seen is this “boulder” in M Sid Kelly’s tweet from October. I don’t know where the masses I find on my home beaches originate, but they must be able to drift some distance. This shale, pitted with piddock burrows, seeems out of place on the sandy spit where I found it. Was it transported here by bull kelp drift? I also should mention the well-known connection between kelp and beach hoppers. The sand under and around this mound of bull kelp was riddled with beach hopper burrows. Lift up any fragment of decaying bull kelp on any sandy beach and you will see little hoppers bouncing around crazily until they suddenly vanish, so much sooner than you expect. My favorite hopper is the California beach hopper, Megalorchestia californiana. I’ve introduced connections involving transport of subtidal rocks, organisms, and food into the surf zone, but there are other connections too. Some mobile surf zone animals like the surfperches, Amphistichus and Hyperprosopon, can temporarily leave the surf zone to feed or take shelter subtidally in the kelp forests. Here’s another connection – bull kelp beds, if large enough, moderate wave force, which could certainly have effects on surf zone dynamics like sand transport and dune erosion. I’m sure there are many more subtidal-to-surf zone connections involving kelp; if you think of any others let me know. Want to learn more about bull kelp? Ecology and Management of the Bull Kelp, Nereocystis luetkeana: A Synthesis with Recommendations for future research is a good place to start. All the bull kelp masses shown in this post are from November 7, 2014. To see what else washed up on the beach that day, go to Wrackline 2014 and scroll down to November 7. M Sid Kelly’s tweets about drift masses of bull kelp earlier this fall pretty much got me thinking about bull kelp and connections I previously ignored. His twitter is full of thought-provoking surf zone natural history, and you may have even seen some of his thoughts and photos retweeted here on theoutershores.